Verypdf.com Inc. has released PDF2Word/RTF v. 1.3, an affordable, easy-to-use Windows application that exports the text, images, and other contents of Adobe Acrobat PDF files to Microsoft Word/RTF format. Unlike conversion utilities that grab only the text from your PDF files, PDF2Word/RTF preserves the layout of your document, as well as the bitmap images and text. PDF2Word/RTF is a completely standalone program, and does not require Microsoft Word, Adobe Acrobat, or even Adobe Acrobat Reader. You can simply drag and drop PDF files to convert them automatically. Alternatively, you can use PDF2Word/RTF's batch operation to easily convert multiple documents. Batch conversion can be done manually at the command line, or you can automate the process by using scripts. PDF2Word/RTF supports page ranges. You can select individual pages, a range of pages, or an entire document. With its emphasis on processing speed, even large PDF files are converted quickly to rich text format for immediate use in Microsoft Word and other word processors. PDF2Word/RTF supports the latest PDF1.5 protocol, which was introduced in Adobe Acrobat 6.0. Whether you're a business person who needs to convert large PDF files into manageable Word documents, an information officer who needs to access and work with read-only PDF files on your word processor, or a home user who needs to capture and save portions of Acrobat files, PDF2Word/RTF provides the tools that you need. Since 1998, Verypdf.com has been developing and marketing PDF productivity software for business and home users. 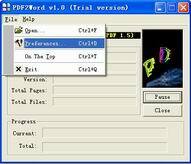 In addition to PDF2Word/RTF, the company also offers PDFcamp Pro, an easy-to-use Windows application that converts DOC, XLS, PPT, TXT, HTML, and any type of printable document into a Portable Document Format (PDF) file; PDF2TEXT, a program that extracts text from PDF files; Image2PDF, an application that creates PDF documents from dozens of different image formats; PDF Extract TIFF, a utility that lets you extract images from PDF files and save them in TIFF format; PDF2HTML, software that converts PDF files designed for paper into HTML files that you can use on the Internet; and Print to Image, a utility that makes it easy to convert documents, spreadsheets, web pages, and other files into raster image files.